Have you ever felt moved by an issue and wanted to share your opinion with hundreds, even thousands of readers? Van Badham has. The columnist shares her views on social, political, and environmental issues through Guardian Australia and is heading to Tasmania this month to show us how it’s done in this masterclass. After graduating, she travelled to the United Kingdom to pursue a theatrical career. There for a decade, she returned to Australia in 2011 for a residency and started writing opinion for The Drum – formulating a direct response to the media’s comments about women in the military. She was approached by The Guardian two years later, had a column published in the first edition of Guardian Australia, and has contributed her opinion weekly ever since. When did you first feel the urge to share a written opinion piece? Ha. I think I had the urge to share my opinion when I was still in the womb; I grew up in Sydney and my parents were devout readers of the Sydney Morning Herald – my dad used to read some of the commentary (and whatever delighted him on the letters page) aloud to us in the loungeroom, usually with a chuckle and the catchphrase: ‘I love these guys!’ when the pieces amused him. I think it’s why I refer to my dad so much when I write opinion; it’s something I associate so closely with him. What are some of the things a writer should consider when translating a strong personal view into a column? In my Guardian masterclasses, I emphasise the point that op-ed is not reportage; you’re not there to present a balance of other people’s considerations on a subject – you are the person whose consideration it’s up to other people to balance. I am a feminist, an environmentalist and have strong, hard left political beliefs, so my opinion is always offered as a rationalisation of an issue within these paradigms, ie: Does this tax reform positively or negative affect women? What is the impact of this factory closure on the working class? Is this decision good or bad for the environment, and what is to be done about it? Alas, I’ve discovered that insisting that all human beings are born equal, that society should allocate resources fairly, and that the planet is a finite resource, engenders ongoing controversy. Anyone considering contributing commentary to the public discourse should be aware that the success of a column is how many of its targets will appear to attack its author. As writers and readers, how can we distinguish between a quality column and an impassioned rant? The difference between a quality column and an impassioned rant is the same as that between great art and hobbycraft; how original it is in its consideration and how well it is executed as a work of literature. In my work, I’m always conscious of a need to add a fresh perspective to the analysis of an issue – I’m not so interested in what other commentators are writing about as much as I am what they’re not writing about, which is why I most of all enjoy writing pieces about working class people, unions, the unemployed and the effects of government policy and corporate activity on the kind of suburban and regional folk who are like my own family and community. It’s also crucial to strive for clarity of expression when you’re writing; poorly expressed ideas will not be understood, let alone shared and adopted. Have you ever felt fear when it comes to sharing your views or having them challenged? If so, how have you built confidence – and if not, why don’t you care? Oh, I love having my views challenged – I’d hardly bother to engage the fray of public discourse if I did not. I cherish a cohort of critics who have sometimes perfectly oppositional views to my own; there’s a conservative commentator called Mark Fletcher who tweets via @clothedvillainly and I rely on his ability to needle my assumptions because he forces me to interrogate whether I am expressing principles or prejudice. That kind of critical engagement with someone you respect obliges you to work hard and be ruthless in your research and rigorous in your conclusions – sometimes, the resulting insights are surprising. As a columnist seeking to influence public opinion, you want to witness in yourself the capacity for your position to change, as it demonstrates your ability for the work you do to effect similar transformations in other people. Also, as I’ve now been writing commentary for three years, I’ve come to appreciate how contexts, particularly political ones, are fluid; what was the correct analysis of a policy position a year ago may be incorrect in the present moment due to any number of shifting circumstances. I do get anxious every time I write a column, because I want to make sure my writing is good, my research is rigorous and that my analysis is correct. As I’ve usually only got a couple of hours to commit something to the keyboard, it is an intense and exhausting process. The internet also means that the tiniest typo or error will be seized upon by your critics as a means to discredit your entire analysis and, while it happens to all writers from time to time, it’s never easy to bear. Those first 10 minutes after the piece comes out are always agonising for waiting to discover what you may have missed. It’s when my opponents react to a piece with an ad hominem attack or paste up a blog speculating on my sexuality, weight, or personal life that I know I’ve done my job. Learning how to process that kind of criticism was a challenge when I started publishing but now I understand it as the inevitable reaction of a target well-hit. I’m very lucky that I have brilliant editors and support at The Guardian, a generous partner, a wise mentor who always takes my calls and a dedicated girl-gang of other women in public life who can annihilate any antagonist with an arsenal of sarcastic gifs and feminist slapdowns. It reminds me that, while writing itself is always lonely, if you have the love of a community, you are never alone. 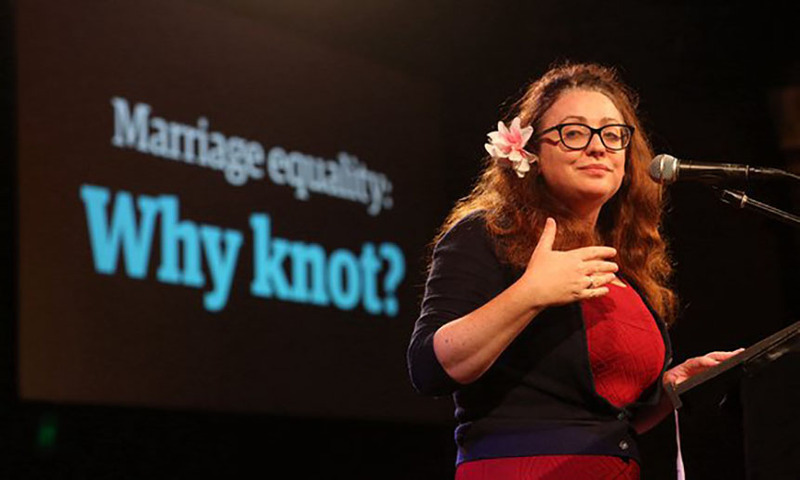 The Tasmanian Writers Centre and The Guardian are teaming up to host the masterclass: How to Write an Opinion Column with Van Badham. It takes place at the Moonah Arts Centre on June 20. For more info and tickets visit the events page.